Hi everyone! Haven’t been posted any thing yet since the last time Sunday Baking. I have been busy busy busy for the last three weeks on the row… My week-ends are always hectic with the kids’ sport activities! Well, boys will be boys they like being active and always running here and there. 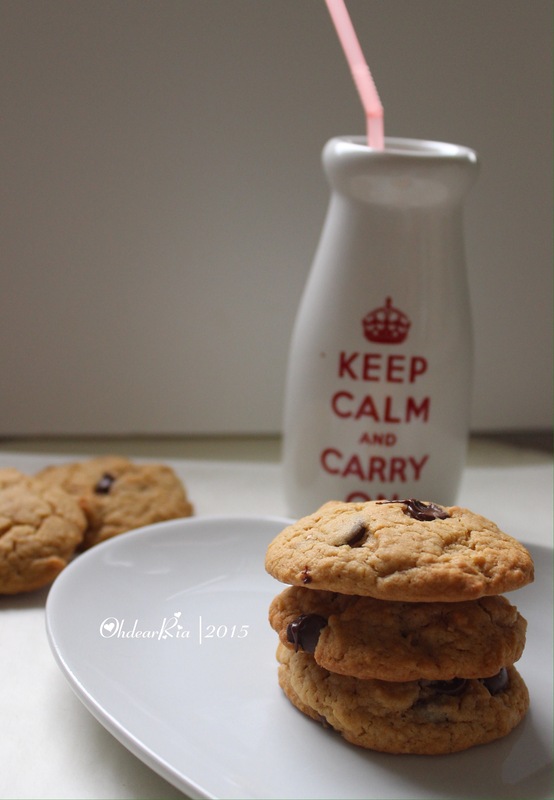 So, this home-made chocolate bickies are always handy to grab when they are on the go! Melt butter in a saucepan over medium heat or in the microwave and set aside to cool slightly. Pour butter into a large bowl and stir in brown sugar and caster sugar until smooth and sugar is mostly dissolved. Sift flours and baking powder together into a small bowl and then gradually mix into sugar mixture until combined. Drop rounded tablespoon of the cookie mixture onto lined baking trays. Bake for 12 minutes or until golden then remove from oven and allow to cool for three minutes before transferring to a wire rack to cool completely. Love the background photo of the bottle!! Aaaaah, enak banget itu Mbak :3 biasanya beli goodtime, mending bikin sendiri ya kayaknya ._.